Grow stronger nails with our 5 surprisingly easy tips! Do you feel like your fingernails are not as strong as they could be? Do they easily become brittle or breakable? Growing your nails can seem like it takes forever, however once you begin to follow an easy routine, you are then able to start the journey towards healthier nails. We have compiled a list of 5 different ways you can help encourage the growth and strength of your nails below! We always promote the intake of water and hydrating your body, however when it comes to your fingernails, it is important to not constantly immerse them in water as this actually softens the nail. Excessive water exposure can actually overhydrate the nail beds as they expand when water is absorbed, and are left fragile once the water has evaporated. Ensure rubber gloves are worn when washing dishes and minimise your nail time in showers and pools! Nail polish can look amazing after a mani-pedi; however, your nails can be prone to dehydration and thinning if you’re using products that contain lots of chemicals. 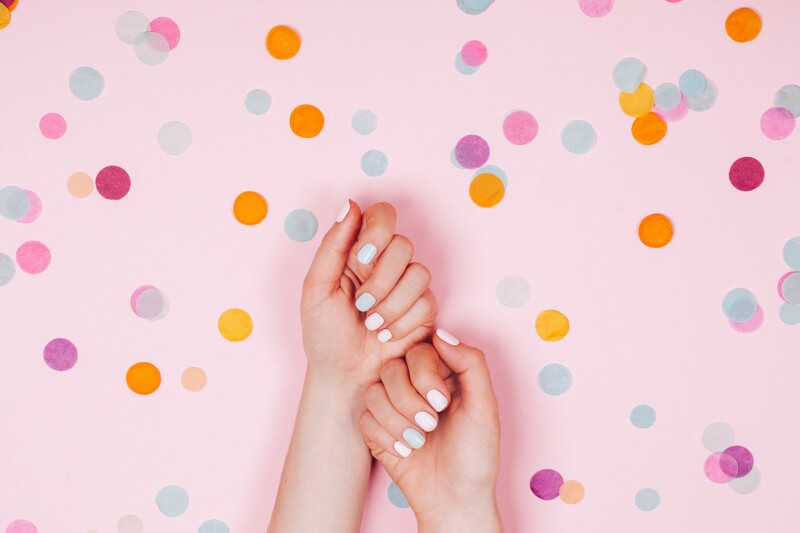 If you do want to spice up your nails, make sure to use nontoxic nail polish and acetone-free removers to keep the natural oils in your nails and skin. Also, be aware of other ways your hands might be exposed to chemicals like certain washing detergents or cleaning products (wear rubber gloves…ideally cotton lined to help avoid damage to your hands and nails!). Show your cuticles a little extra love and attention! We’ve always been led to believe that trimming your cuticles is better for the health of the nail, however they are a part of your skin and are a vital protective barrier for your nails and help to avoid nail infection. Removing the cuticle does not benefit your nail as it leaves it vulnerable and open. A quick and easy remedy to give your nails TLC is by moisturising the nail with a nourishing oil or balm. When filing your nails, it’s best to use a fine-grit cushion, so it’s soft on the skin and still leaves your nail smooth. Also, filing consistently in one direction is recommended as there is less opportunity for weakening of the nails and leaves a smoother edge. When cutting your nails, it’s wise to avoid growing them too long as this leaves more opportunity for breakage, as short nails are less likely to break and are easier to maintain! A key to continually strong growing nails is maintaining a healthy diet. Certain foods like wheat bran, rice and spinach contain silica and biotin, which provide you with the support for nail strength. Other magnesium-rich foods like almonds, fish and bananas can help smooth your nails’ ridges, and calcium is also essential for encouraging growth. So, get started on including these types of foods into your eating regime while you are strengthening your nails! Nails need to be taken care of as you are constantly using your hands in many different types of situations. To help increase the strength of your nails, include a silicea One a Day supplement to your diet to help encourage nail thickness and strength, and reduce splitting. Find the full range of our products here http://www.silicea.com.au/home/. Next Next post: How to keep your skin feeling fresh in the workplace!